Eastern Carpets have been serving customers in North Walsham and the surrounding areas for over 30 years! 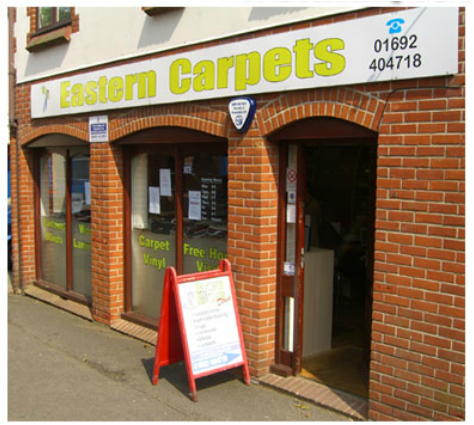 Eastern Carpets, based in North Walsham, Norfolk have a showroom based in North Walsham town centre, displaying a large range of carpets, flooring and blinds available. Suppliers of top brands of flooring such as Abingdons, Cormar, Flotex, Seagrass. Eastern Carpets offer flooring from lino, laminate flooring, through to stain free carpets, and even artificial grass. Always offering a friendly and helpful service, Eastern Carpets go the extra mile to help their customers, old and new. From moving furniture around, to uplifting and disposing of old flooring. We offer a made to measure blind service for Roller, Venetian or Vertical Blinds. Free Measuring Service and Free Estimates. We offer a full fitting service which includes uplifiting and disposal of old flooring. We will also move furniture and appliances for you to fit the flooring. Call Eastern Carpets today for a fast and friendly service on 01692 404718, or browse the showroom and look through the many swatches and types of carpets and flooring available.